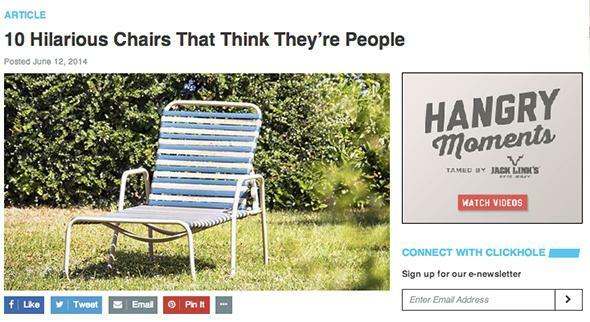 Clickhole: The Onion’s new site is more than a BuzzFeed parody. The Onion’s new project is a pitch-perfect BuzzFeed parody. Can it be more than that? 10 Hilarious Chairs That Think They’re People. QUIZ: Which Hungry Hungry Hippo Are You? The first is a dig at Upworthy, the feel-good viral-video site with a cloying habit of telling you what to think about its clips before you’ve even watched them. The second and third skewer BuzzFeed’s Facebook-optimized animal listicles and quizzes, respectively. If Clickhole were nothing but a list of headlines, leading nowhere, it would still be an exquisite bit of satire. The site perfectly captures the tone of the manipulative clickbait that has come to pervade online media, while dialing the absurdism up to 11. (Which reminds me, don’t forget to read Clickhole’s very helpful sponsored post courtesy of Jack Link’s Beef Jerky, “8 Ways to Dial Up Your World Cup Party From 0 All the Way to 3 or 4.”) Clickhole highlights not only the vacuousness of much of what people share on social media, but the media’s cynical (if understandable) response to an advertiser-driven incentive structure that rewards page views over substance. It’s tempting, then, to peg Clickhole as the ultimate BuzzFeed parody. Already it has been widely glossed as such. But if that’s all it were, there would be little reason for readers to come back once they’d seen it. Fortunately, Clickhole is more than just funny headlines—and viral-media sites are hardly its only target. Scroll around a bit and you’ll see what he means. “10 Kicks You Should Know About Before You Watch the World Cup” pokes fun at explainer sites. “EXCLUSIVE: A Look Inside the 2014 World Cup Soccer Ball” wouldn’t look out of place above an infographic on a high-end tech blog. And a headline like “Could This Contraption Be the Next Revolution in High-Speed Travel?” would nestle comfortably on the homepages of Time, The Week, or even Slate, perhaps in reference to Elon Musk’s latest whiteboard scribblings. The joke is that the accompanying image shows a ferris wheel. My favorite Clickhole post so far: “Stanley Tucci’s Racist Tirade: Our Take If It Ever Happened.” I read it as a riff on the blogosphere’s habit of confidently weighing in on things without taking the trouble to verify that they actually occurred. The article’s earnest tone—it takes pains to acknowledge that the tirade in question is entirely hypothetical—almost makes you feel sympathy for the struggling 23-year-old bloggers who, you imagine, are just trying to meet their page-view quotas for the day so they can pay the rent on time. Clickhole’s idiom, in short, is not that of any one site: It’s that of the Internet at large. More importantly, Affonso says Clickhole isn’t just about making fun of online media, any more than the Onion is just about making fun of local newspapers or The Colbert Report is just about making fun of Fox News. Just as the Onion adopts the self-serious, faux-objective tone of local newspapers to satirize everything from American politics to sports to sexual mores, Clickhole intends to use listicles, quizzes, explainers, and bloggy commentary to take on a wide range of topics, including some that were hard to shoehorn into the Onion’s house style. That makes sense. After all, teaser headlines aren’t the only things that differentiate online media from traditional print publications. The substance of their coverage is different, too. The Onion itself, which began as a print newspaper, has responded to the changes wrought by the Internet in its own way. It has gotten faster and more topical, of course, and less selective in what it publishes. Some observers, including my former colleague Farhad Manjoo, lament that its humor has grown more facile. In short, the Onion has a surprising amount in common with the legacy news organizations it satirizes. In that context, Clickhole might be to the Onion what a project like Know More is to the Washington Post—a bid to keep up with the times without sacrificing the things people loved about the original brand. It’s appropriate, then, that Clickhole’s business model appears to be awfully similar to that of BuzzFeed. Look to the right of the home page and you’ll see a box called CashHole populated by teasers like “6 Heads You Never Realized Are Also on Mount Rushmore.” It turns out to be a jokey listicle very much in Clickhole’s wheelhouse, except that it’s dotted with references to Jack Link’s Beef Jerky and links to the Jack Link’s site. It’s a joke about native advertising, but it’s also native advertising, and presumably the money Jack Link’s is paying Clickhole is no joke. The irony is that, in order to survive as a clickbait parody site, Clickhole can’t actually just be clickbait, because its jokes only work on people who recognize clickbait when they see it. If the articles themselves don’t deliver, people will stop sharing them. If Clickhole succeeds, though, perhaps even our more credulous Facebook friends will grow a little more sophisticated about what they like and share. Then it won’t just be Clickhole that has to back up its headlines with satisfying stories. It will be all of us.